Under heavy pressure and threats from Washington, the UN Security Council voted unanimously on Monday evening for harsh new economic sanctions on North Korea following its sixth nuclear test, the largest to date, on September 3. 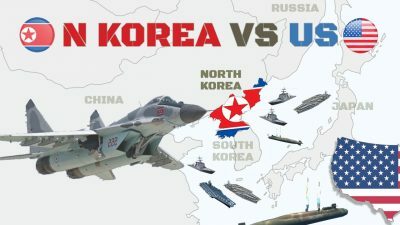 Far from easing tensions in North East Asia, the resolution sets the stage for further US provocations and heightens the danger of military conflict on the Korean Peninsula. While the US made concessions to China and Russia to obtain their support, the new bans further isolate the North Korean economy and threaten to precipitate an economic and political crisis in Pyongyang. Following on from the Obama administration’s sanctions last year, the Trump administration is not specifically targeting North Korea’s nuclear and missile programs, but is seeking to cripple the country economically. After North Korea’s nuclear test, Washington pressed for a complete oil embargo, a global ban on the use of North Korean workers abroad and a mandate to use military force to inspect ships suspected of carrying goods prohibited under UN resolutions. China and Russia, which fear the US will exploit any crisis in Pyongyang to install a pro-American regime, opposed these sweeping measures. An annual cap of 8.5 million barrels on the sale of refined and crude oil to North Korea. The sale of natural gas and condensates is prohibited, to close off possible alternative fuels. A US official told the Washington Post that the figure represents a 30 percent cut. UN member states will be required not to renew the contracts of an estimated 93,000 North Korean guest workers, whose wages bring in an estimated $500 million a year to North Korea. The only caveat is for guest workers who are deemed necessary for humanitarian assistance or denuclearisation. Countries will also be obliged to inspect ships suspected of carrying North Korean goods that might be banned under UN resolutions. Any ship found to be carrying banned goods will be subject to an asset freeze and may be barred from sailing into ports. The resolution, however, drops the US proposal to allow the use of military force, and the consent of the country in which the ship is registered is required. The purchase of all North Korean textiles is banned. Last year, textile exports were $726 million, or more than a quarter of North Korea’s total export income. This comes on top of UN bans last month on the export of coal, iron, iron ore, lead and seafood estimated to be worth $1 billion, or about one third of export income. The resolution did not include a travel ban and asset freeze on North Korean leader Kim Jong-un as originally proposed by Washington. While blocking aspects of the draft US resolution, China announced its own unilateral financial sanctions yesterday that could have a far-reaching impact on North Korea. The country’s top five banks—Bank of China, China Construction Bank, Agricultural Bank of China, Industrial and Commercial Bank of China, and Bank of Communications—will freeze the opening of new accounts by North Korean individuals or companies. Three of the five banks said they had started “cleaning out” existing accounts by blocking new deposits. The Financial Times pointed out there were ways to circumvent the new ban, including through the use of Chinese citizens as intermediaries. Two Chinese businessmen who run companies in North Korea, told the newspaper that all their payments to North Korean staff were in Chinese currency, avoiding the use of Chinese or North Korean banks. Nevertheless, the new Chinese sanctions will make it far harder for major North Korean enterprises to conduct financial transactions in China—their chief connection to the global financial system. Beijing’s banking ban is a clear sign of rising tensions with the Pyongyang regime, which has publicly criticised China for supporting UN sanctions. Relations between the two countries, which are formally allies, deteriorated markedly after Kim Jong-un ordered the execution in 2013 of his uncle Jang Song-thaek, who was regarded as close to Beijing. China’s President Xi Jinping is yet to meet Kim Jong-un, and the last high-level visit by a Chinese official to Pyongyang was nearly two years ago. North Korea’s September 3 nuclear test publicly embarrassed Xi, who was hosting a summit of BRICS (Brazil, Russia, India, China, South Africa) leaders at the time. While not wanting the collapse of the Pyongyang regime, China has opposed North Korea’s nuclear and missile tests because they provide a pretext for the US to maintain and expand its military presence in North East Asia. Beijing also fears that Japan and/or South Korea could exploit the “threat” posed by North Korea to justify building their own nuclear arsenals. Before the adoption of the latest UN sanctions, North Korea lashed out at the US, warning it would respond in kind if Washington managed to “rig up the illegal and unlawful resolution.” An official statement declared that North Korea would take measures to “cause the US the greatest pain and suffering” it had ever experienced. Far from defending the North Korean people, this empty nationalist bluster only plays directly into the Trump administration’s hands. The American ambassador to the UN, Nikki Haley, yesterday suggested the US was not looking for war and North Korea could “reclaim its future” by abandoning its nuclear program. But the Trump administration has repeatedly declared that all options are on the table—including pre-emptive military strikes against North Korea. Earlier in the week, Trump huddled together with his top military and national security advisers to review all options, which, according to NBC sources, included the possibility of pre-emptive US nuclear strikes on North Korea. Featured image is from Zobiyen TV.